For several months, persistent advance publicity has constantly reminded both brass band enthusiasts and the concert-going Welsh public that Cory Band was celebrating the 125th anniversary of its founding in a special celebratory concert, to be held at the prestigious St. David's Hall, Cardiff on Saturday (20 June) under the headline banner - BRASS & VOICES…and all that jazz. Arriving at the Hall, the foyer, bar and auditorium were buzzing with anticipation. In his prologue from the stage, Cory's President, Bernard Jones, reminded the audience that the band had just cause to celebrate, having frequently tasted the delights of competitive success in the National Championships of 1974, followed by a hat-trick of wins in the early 1980s. 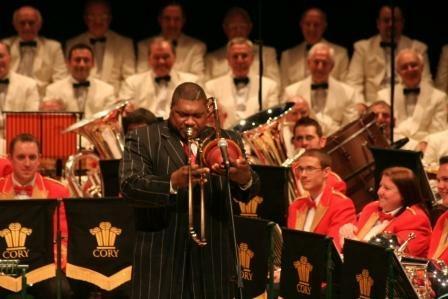 The appointment of Dr. Robert Childs as MD in 2000 heralded a virtual decade of unprecedented success for Cory, the band’s current accolades including becoming European Champion two years successively (2008/09) and Brass in Concert Champion in 2008. Pausing briefly for breath, Bernard Jones proudly proclaimed that Cory Band is also currently ranked first in the world and by a considerable margin too! No pressure then for the band as it entered the auditorium to open the concert with a scintillating performance of Enter the Galaxies (Paul Lovatt Cooper). In a fitting tribute to Walter Hargreaves, who did so much to re-shape Cory’s sound and style in the early 1950s, the band launched into his brilliant arrangement of the Glinka overture - Ruslan and Ludmilla. The playing matched the quality of the arrangement and one could imagine the ‘wee Professor’, as he was affectionately known, smiling in gratitude - rare praise indeed! 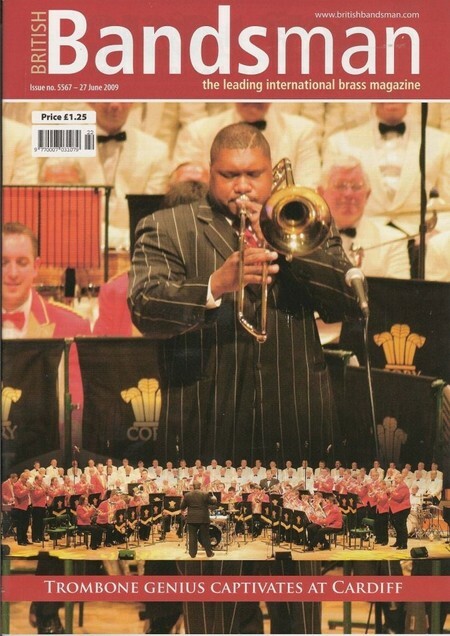 Front page of British Bandsman 27 Jun 2009. The choral guests for the evening, the world-renowned Morriston Orpheus Welsh Male Voice Choir, is well experienced in Brass and Voices concerts, having previously appeared at the evening concert that followed the National Finals in the Royal Albert Hall, London. Featuring music of Celtic origins in the first half of the concert - Myfanwy (Joseph Parry, arr. Dan Price) and Danny Boy (trad., arr. A. Humphreys), the choir's sound impressed, with obvious enhancement from the quality of the brass accompaniment. The appearance of the renowned jazz trombonist, Wycliffe Gordon, had been much heralded. In a BBC Radio Wales interview, just prior to the concert, it emerged that David Childs had been mightily impressed with Wycliffe Gordon's astonishing virtuosity when they had previously performed as soloists at a music festival in Australia. A purposeful stride to the podium followed by an equally majestic yet relaxed performance of Sweet Georgia Brown (Bernie and Pinkhard, arr. Robin Dewhurst), immediately captivated the audience. Supported by the band and the Robin Dewhurst Trio, the technical and musical wizardry displayed by this superbly accomplished trombonist ensured that the audience responded with the sort of prolonged admiration and enthusiasm rarely experienced in concerts of serious music. This was followed by one of Wycliffe Gordon’s own composition - Me We, in which the articulation, range and dynamics displayed were simply breathtaking! So it was fitting that this part of the concert should close with music from the pen of Dr. Peter Graham - On the Shoulders of Giants. Written in three sections, the music pays tribute to the giants of the various types of music- making in the US and drew a performance of remarkable musicianship from the band. During Cory’s centenary concert, also staged at St. David’s Hall under the baton of Major Arthur Kenney, The Year of the Dragon (Philip Sparke) received its world premiere. How appropriate, then, for music by Philip Sparke to be given yet another world premiere. Played in immaculate style, Hail the Dragon is destined for many future performances due to its ready accessibility to players and audiences alike. Paying tribute to the popular Welsh composer, Penclawdd-born Karl Jenkins, the Morriston Orpheus Choir and Cory joined forces to present five movements of the composer’s ever popular Adiemus -The Journey. The final offering from the Choir, Shenandoah (trad., A. Humphreys), allowed Dr. Robert Childs to demonstrate his widening skills as a choral conductor, as he coaxed a persuasive rendition from the Choir and brass accompaniment. The re-appearance of Wycliffe Gordon enabled the audience to savour his vocal skills. In typical Louis Armstrong style (Wycliffe readily confessing his admiration for the 'King of Jazz'), Wonderful World (Cook/Adler/Alpert, arr. Robin Dewhurst) was an absolute delight of clear diction and phenomenal trombone playing. Another of his own compositions, Hallelujah Shout, revealed his jazz background to the full. With skat vocals, followed by what may be best described as an intimate conversation between Wycliffe and his trombone, the interlude ended in tumultuous applause. Yes, a veritable show-stopper! Special mention must be made of the accomplished, home-grown percussionist, Dave Griffiths (pictured above), who was the versatile kit player in the trio supporting Wycliffe Gordon, providing high quality rhythmic drive to the backing group. The concert ended in fine style with a reprise of the finale to the band's winning performance at the 2008 Brass in Concert Championship. Sing Sing Sing (Louis Prima, arr. 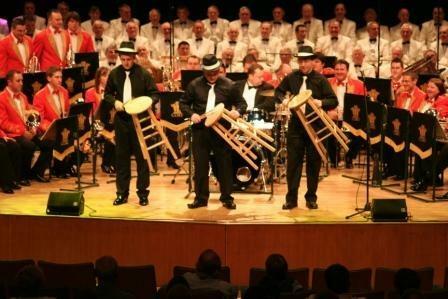 Dan Price) complete with bar-stools, trilbies and flashing drumsticks, was followed by an impressive performance of American Tale (Dan Price), which featured a narrative by the Welsh raconteur and compere for the evening, Roy Noble OBE. Both Wycliffe Gordon and the Choir added colour to this stylishly presented finale. Throughout this celebratory concert, the presentation and performance by Cory was of the highest level. Effectively led by Ian Williams, who is arguably the longest-serving and most successfully consistent Principal Cornet in the history of Cory Band, the entire ensemble's response to the direction of Dr. Robert Childs was exemplary. There will be much talk in the future of Cory’s high quality performance, as well as that of the amazingly virtuosic trombone playing of the guest soloist for the night, Wycliffe Gordon. In true Welsh tradition, I will be proud to say"I was there!" 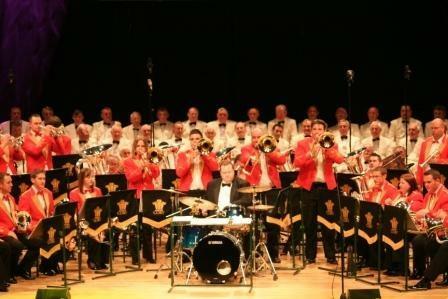 Proceeds from the concert were donated to the worthwhile charity, Cancer Care Cymru.